Sweltering summer days are upon us and although St Louis is humid and hot, the weather hasn't kept me indoors. While I lounge on the patio, watching the kids splash in the pool I love to have a crisp icy glass of lemonade by my side. Since my beautiful rose bush is in full bloom, I thought I'd make the most of the lovely pink blossoms with rose lemonade. combine 2 cups sugar and 1 1/2 cups water in a sauce pan and bring to a boil, stirring to dissolve the sugar. This makes a syrup. In a pitcher, combine your syrup, lemon juice and 5 cups of cold water. Next comes the rose water. Start with a few tablespoons and see how you like it. You can always add more. I ended up with about 1/8 cup of rose water in my pitcher plus some extra lemon juice because I like mine pretty tart. Almost like a drinkable Turkish delight. Sounds delicious, and so pretty in a glass. 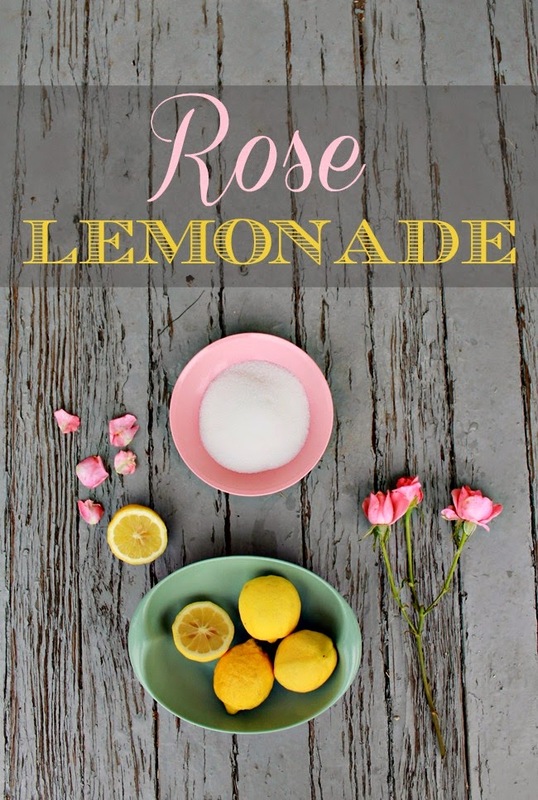 Sounds wonderful and definitely a new twist on pink lemonade, and my kids would love picking the petals from our roses. Hey, I have a rose bush now! I may have to try this soon! Mm... needs gin. Or vodka. ;) Absolutely gorgeous! I have the exact same juicer! I love it. I will try this for my next summer tea party! Thank you!